Coin collecting is becoming more and more of a niche pastime, with so much currency going online (or becoming plastic). So the Toronto Coin Expo is offering free admission to any budding collectors 16 and under interested in seeing how coins are evaluated, appraised, and sold at auction (adult admission is one of those blue plastic $5 bills, plus $1 at least of ‘tin’). September 29-30, Toronto Reference Library (789 Yonge Street), 10 a.m.-6 p.m., $6 (16 & under are FREE). The inaugural Venus Fest is especially timely, given that one of the artists on their bill, Lido Pimienta, won the prestigious Polaris Prize last week. (Torontoist has had Lido tipped for big things for a while now.) Also on the all-day, all-female-fronted fest’s bill of a dozen acts: Weaves, The Highest Order, DIANA, and Queen of Swords (a.k.a. fest organizer Aerin Fogel). Daniels Spectrum (585 Dundas Street East), 1 p.m.-11 p.m., $37-$60. DIANA plays Venus Fest today. 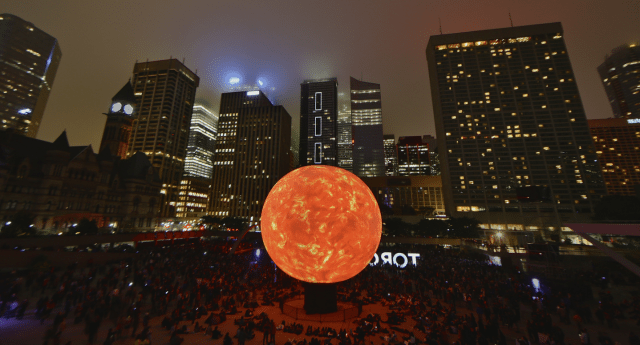 The city’s annual “all night art thing,” Nuit Blanche, follows in the spirit of dozens of other cities around the world, programming installation, experiential, and performance art from sundown to sunrise across the city. Highlights this year could include “Have You Seen My Sister,” a 12-hour choral performance reciting the names of missing and murdered women; the “Taking to the Streets” exhibition, which will feature eight installations at U of T and Queen’s Park; and “Truth,” an installation by graffiti artist KWEST (a.k.a. Brian Leitch) at Yonge-Dundas Square, which hasn’t been a Nuit Blanche location for several years. City-wide, 7 p.m.-7 a.m., FREE. Click here to view Sunday’s picks.